February’s Diamond Previews catalog is in comic stores now! 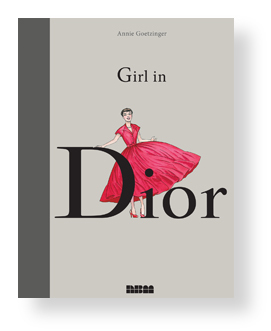 NBM has some great offerings to showcase in February including the remarkable GIRL IN DIOR, by Annie Goetzinger. Also featured is our unique accordion book, STREET VIEW, which is sure to provide a new experience. A visually incomparable treat and a brilliant homage to Hitchcock’s Rear Window, this unusual accordion book opens in two directions. One, a series of ten tableaux on a street scene as it evolves during the day. The next on 10 evening tableaux of the same view. 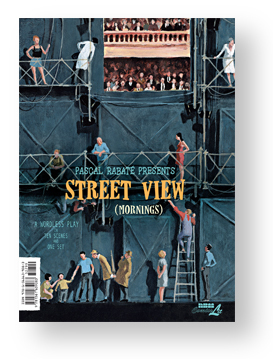 A window may serve as a source of light and fresh air, but it also presents a view onto the life of a street and its many other windows, each a separate scene of its own, with its multitude of on-going stories developing before your eyes. Within those windows, you can witness the lives of single people, couples, families, stories of love, separation and possibly even… murder. 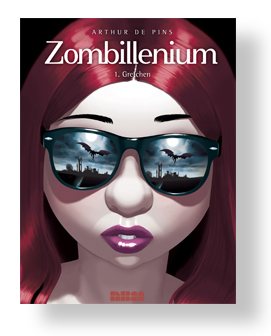 In this month’s PREVIEWS we are also revisiting ZOMBILLENIUM to get you ready for next summer’s release of Volume 3! 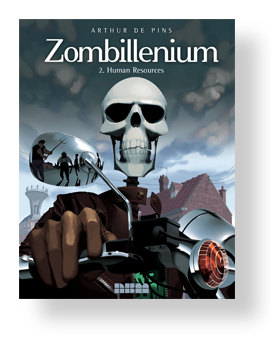 ZOMBILLENIUM VOLS 1 and 2 and STREET VIEW are available to purchase now. GIRL IN DIOR will be available starting in February. To place an order please visit our website, or place your order with your local comic book store now!